We will not recruit players registered with other clubs during their season. Player Commitment to a Club -- Once you and your parents have decided to sign an offer during HOA sanctioned signing period, you will not be allowed to reverse that commitment or attend any other tryouts. Per HOAVB regulation, offers will not be made until July 9th and after for players not registered with Mizuno Club North for 2019 season. IMPORTANT NOTE: Every effort will be made to select players of similar skills & talents for our top teams to develop for competition at upper level of their age groups Regionally and Nationally. 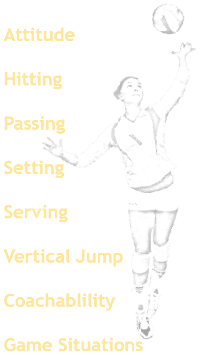 At the TRYOUT/OPEN GYMS, participants will be evaluated in SOME OR ALL of the following (based on time availability) - SERVE & SERVE RECEIVE, SETTING, HITTING, DEFENSE, SPEED/AGILITY/QUICKNESS, JUMP, TEAM WORK, ATTITUDE, COACHABILITY, GENERAL BALL CONTROL & DECISION MAKING during Individual Skill and Game Situations. In 2019/2020, we are going into our 27th year as a USAV Juniors Club and have many years of experience among our coaching staff. All of our coaches are USAV Impact certified and have developed teams achieving success at the Regional and National levels.